An absolutely gorgeous day here in Edinburgh today, not a cloud in the sky and my child’s thermometer measured 34.2 degrees in my garden. Honest. We four had a great day in our wee garden, my wife cut the grass and clipped the shrubs while I got to play with the twins. 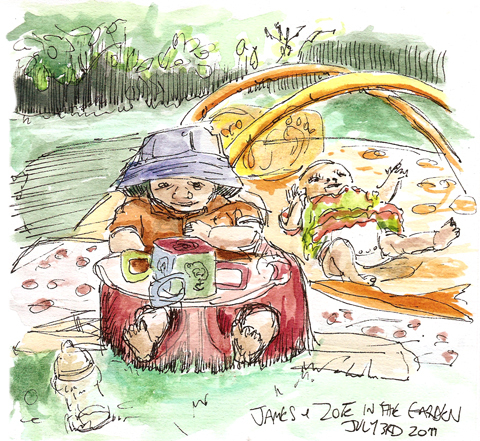 I also made this watercolour sketch of them enjoying the sunshine. James is happy in his ‘bumbo’ seat as Zoe hits the ‘playgym’ behind. Soon after we took a walk down to Granton Harbour for a look at the boats, a great place to sketch on the docks. I bet there’s a lovely sunset down there about now.